Tim Carder’s Encyclopaedia of Brighton, published in 1990, is still the definitive reference work on the history of Brighton. 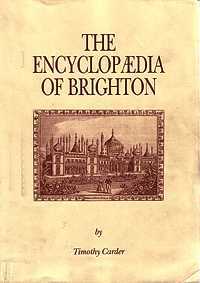 Thanks to the generousity of its author Tim Carder, who gave permission for us to transfer his text to My Brighton and Hove, we began the mammoth task of publishing the Encyclopaedia in full on the site in October 2006. The original text was transposed onto the site and enhanced with photos and illustrations. We are pleased to say that, thanks to a dedicated team of volunteers, the project is finally completed. It was hard work but was a labour of love. The wealth of information provided by the encyclopaedia has certainly greatly enhanced the website. Of course we could not let this auspicious occasion pass without a celebration! 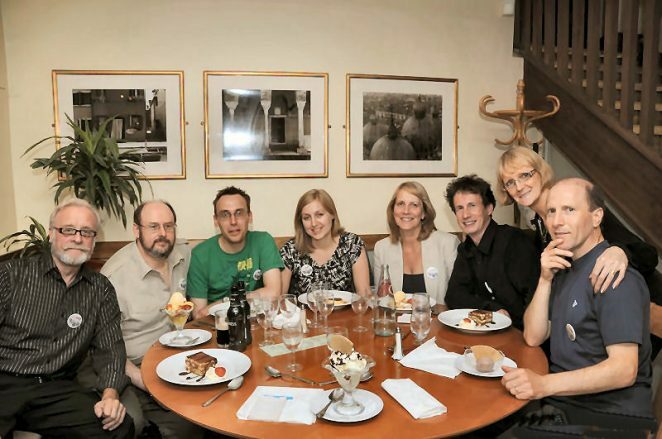 So the project team, joined by Tim Carder the author, met up in a well known local pizza establishment. Aided by good food and a glass or two of house vino, we reminisced about our experiences and toasted our success. You can find any of the topics covered in the Encyclopaedia of Brighton by searching through My Brighton and Hove in the normal way. If you need any photo’s regarding the Royal Pavilion, Pavilion Gardens, events such as the Children’s Parade, Streets of Brighton or Gardens restoration etc Really anything in the Pavilion Estate over the years. Please ask, as I have an extensive photograph archive you could use for free. It’s great that Tim’s work is going to get a wider audience. I made use of it for my Oxford Brookes University Cartography dissertation on the History of Brighton maps back in 1998-1999. It would be very helpful if the development section (49) could be marked up on a map. This I did during my dissertation work, as prior to that I had great difficultly in locating streets and the development section they were listed under. A 6″ Ordnance Survey map from the 1930s, the OS 1934 Town Plan of Brighton or one of Hadlow’s maps from the Official Handbook of Brighton might work as a base map. I mention the latter because as it was published for the Brighton Corporation and it included Saltdean. Not all of Hadlow’s publications included the Saltdean area. I still refer to Tim’s book today to help date any maps I buy of Brighton and Hove. I’m currently doing a masters dissertation which makes use of maps of Brighton and Hove. In fact since my last dissertation, during which I spent many hours in the Brighton Reference Library and the Bodleian library in Oxford, I have come across so many maps that I never knew existed. There is clearly much more work to be done in this area of research. There is currently a study going on into UK town plans published before 1900. Hopefully that will be extremely useful for the older mapping once published. I must add that the maps of Brighton and Hove put onto card by the Brighton Reference Library were of very poor quality and have not been improved since 1998-99 when I did research into my first dissertation. I am fortunate to be able to work with maps I’ve purchased myself. That way I don’t have to deal with any external bodies or image ownership issues, as I own all of the copyright to the maps, the maps being out of copyright. I must add that at the time Tim published his book, Brighton and Hove were not joined so their is still a wealth of information to be complied on Hove, should this site be about Hove as well as Brighton. I have bookmarked the site and no doubt I will be returning to it in the future. Dave, would you have any photos of Regent Hill before the houses were demolished to make way for the Ministry of Labour building ? I used to live at No 11. I would like to know if it is possible to buy a copy of this book. It’s great to have it on line, but I do like the real thing too! My Brighton roots go back a long way, and the E.o.B. has been invaluable in putting my family history together. Editor’s note: Sadly this book is no longer available to buy, it was a limited print run and there are no plans for a reprint. Copies do come up for sale second hand from time to time; try searching on http://www.ebay.co.uk or an online book store such as http://www.abebooks.co.uk. Good luck. Tim’s book is brilliant. I was reminded of it by this discussion today and I’m pleased to see it now has another life on this excellent website. It’s great to see so many old photographs here too. It’s such a shame the book is now out of print. I’ve been aware of it for a few months and have tried to track down a copy with no success so far. It’s becoming as hard to find as a copy of Tallis’ 1850s Brighton map. To Alan Possee: I have an old photo of the Lathcleaver’s Arms Regent Row circa 1900. But I need to know how one copies it to this site. Keep looking Alan, I’ll get it on when my grand children gets round here to show me how. Editor’s note: If you look here Geoff, you will find a useful video on how to make submissions to the site – hope you find it useful. I am very pleased to announce that Brighton & Hove Libraries are publishing a new updated version of the Encyclopaedia which will be in bookshops at the beginning of February next year. Does anyone have pictures of Spring Gardens before it was pulled down? Many thanks.